Sous vide cooking is a method of preparing food in which the food is sealed into a plastic bag and then placed in a water bath. Here, it is cooked for a relatively long period of time at a relatively low temperature. The goal of sous vide cooking is to cook food more thoroughly and evenly than can be achieved with other methods of cooking. Sous Vide – where did it start? While there is some conjecture on where sous vide cooking was actually invented, it was certainly popularized by French chefs in the mid-twentieth century. From there, it spread to United States. Many French chefs moved to the United States and used the sous vide method of cooking in their kitchens, which introduced it to American diners. How can you use Sous Vide at home? In recent years, sous vide cooking equipment that is easy for the average person to operate has become commonly available for reasonable prices. Somebody who wants to try sous vide cooking at home needs a vacuum sealer to seal the food in the bag and a water bath device to actually cook the food. Steaks are often cooked with the sous vide method, however other types of meat and even vegetables can be cooked with this method. Read on to learn more about how to cook food (specifically a sous vide steak) with the sous vide method at home. One of the most important and overlooked aspects of properly grilling a steak (no matter what method you are using) is choosing a great cut of meat. The thickness of a steak is also important. A thin steak is very easy to overcook. There is a fine line between cooking a thin steak properly and overcooking it. A thick steak, on the other hand, is easier to cook properly. Your steak should be at least an inch and a half thick, and you should try to find a steak that is at least two inches thick. These steaks will be quite large, sometimes over a pound. Of course, you can split a steak with someone if your appetite is not big enough for the entire steak. It is vital when cooking a steak to have the temperature chosen before the cooking process begins. When deciding how hot of a temperature you will cook the steak at, you need to keep in mind what internal temperature these steaks will reach. This is what determines if a steak is rare, medium, or well-done. As a general guideline, a steak which never has an internal temperature over a 120 degrees will be rare. If the temperature never exceeds 140 degrees, the steak will be medium. The steak will be well done if the temperature hits 160 degrees. It can be difficult to hit exactly the right temperature when using traditional cooking methods. However, it is much easier with sous vide cooking. This is because these steaks are cooked much slower, which means you have more time to react when the steak hits the correct temperature. Sous vide allows you to maintain your desired temperature for as long as you want, so these steaks will be hot when you want to eat it. As with all methods of cooking steaks, rare and medium-rare steaks are generally considered to be the tastiest. Sous vide cooking is not recommended for people who want well-done steaks. As a general rule, types of steaks that have more fat need more cooking time. This is because the fat acts as a natural insulator. Ribeyes and strip steaks are best cooked medium-rare to medium, which means the internal temperature is from 129 degrees to 135 degrees. Porterhouse and T-bone steaks on the other hand, are a little bit different. They both contain tenderloin and strip parts. Experts suggest taking a temperature based on which part you like the best. This could be the strip or the tenderloin. It’s up to you. When cooking a sous vide steak, the temperature is most important, but the timing is almost as important. Very rare to rare steaks should be cooked from 1-to 2.5 hours. Medium-rare steaks should be cooked for 1 to 4 hours. Shorter times are better for medium-rare steaks as they are for all steaks. Medium steaks should cook for 4 hours, while medium well steaks should be cooked 1 to 3.5 hours at roughly 150 degrees. Well done steaks, which are not recommended for these sous vide cooking method, should be cooked to 160 degrees or more for 1 to 3 hours. Tenderloin is easy to overcook, and is it little bit more difficult to get right, even with the sous vide method. As a general rule, tenderloin should be cooked for a slightly shorter amount of time. How much shorter depends on a specific piece of meat. Pay close attention to how thick it is and how much fat is in the meat. Step 1: Preheat the cooker to your chosen temperature and let the water bath heat up. Step 2: Season the steak with your preferred amount of pepper and salt. Step 3: Add a few bits of aromatics such as thyme or rosemary (if desired). Step 4: Seal the bag using your vacuum sealer. Step 5: Cook the steak for the desired length of time. Step 6: Remove the steak from the bag and pat dry. Optional: Finish browning the steak on the stovetop or the grill. Some people like to finish their sous vide steak by browning it on the grill for improved texture and flavor. To do this, heat the grill up to a very high temperature and cook each side of the steak just long enough to sear it and caramelize the meat. Anova Sous Vide heats and circulates water in the pot, evenly cooking food to a precise temperature to guarantee perfect results every time. Cook everything from meats, fish and vegetables to soups, and desserts. Simple interface on the device to set the time and temperature manually – or use the Anova Sous Vide Culinary app to find your cook settings and hit ‘Start’. The Joule Sous Vide is the smallest, sleekest sous vide tool available, at just 11 inches tall and 1.3 pounds. So small it fits in your top drawer. 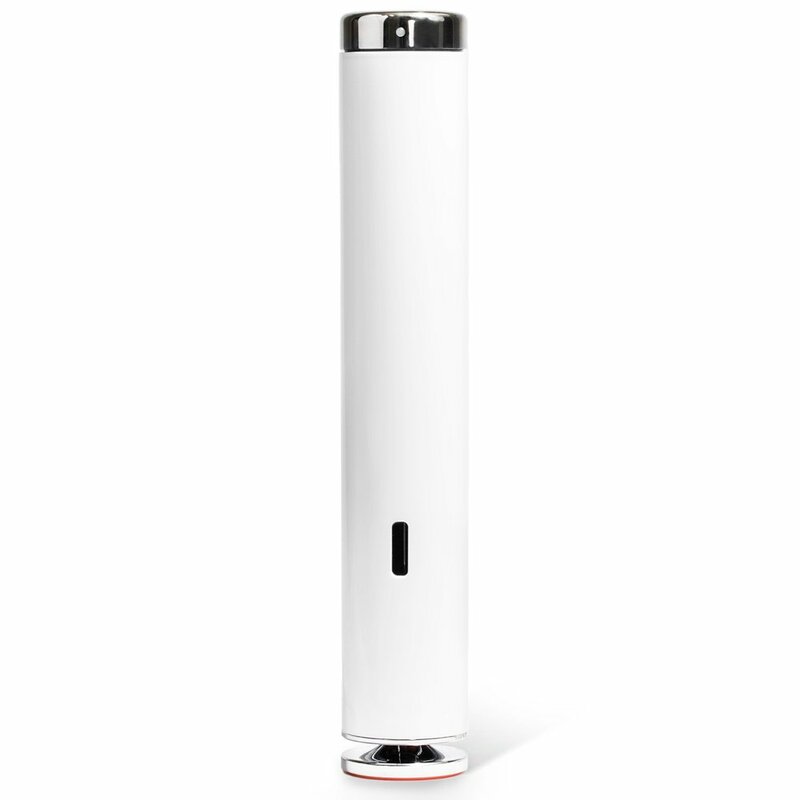 Fastest water-heating capability on the market, with 1100 watts of power and hyper-exact temperature control, precise to 0.2 F / 0.1 C.
The magnetic base and side clip mean Joule Sous Vide works in any pot and with a variety of water levels and volumes, from just 1.5 inches all the way up to 10 gallons. No special equipment required: use Joule Sous Vide with the pots you already have, the Android or iOS smartphone you use every day, and any ziplock-style freezer bags. No vacuum sealer needed. Voltage warning: Works with 120 V outlets only. Due to our precise heating technology, voltage transformers and converters can damage your Joule Sous Vide, and use outside of North America voids the warranty.